It is hard to believe that two weeks have passed since we climbed aboard that Twin Otter to begin the long journey home. But it has. After weeks of traveling, Stephen and I have made it back to Rhode Island, to warm nights and shade trees, to stars and crickets, and most importantly – to tomatoes! This farm in the woods is a good place to ponder this journey of ours. It was so much crazier, so much more of an adventure, than we we had anticipated it would be. 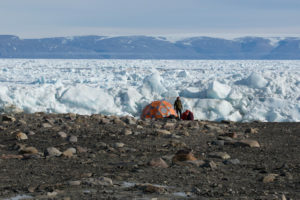 The day before we headed out on our journey, we all crowded around the computer in Resolute Bay to look at the latest satellite images of Nares Strait. It was our last chance to see an overview of where we would be traveling. What we saw was lots of sea ice in the Strait. The images did not alarm Steve. 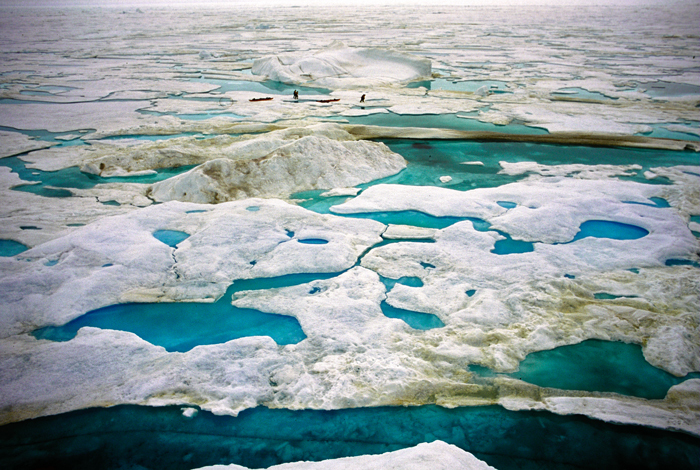 From his thirty seasons spent in the Arctic, he expected to see lots of ice in the Strait. But what the satellite images did not fully reveal to us was the quality of that sea ice. We could not see ‘slurpy’, our term for the mess of jumbled bits of Arctic sea ice that beset us for most of our 33 day journey. The resolution simply wasn’t there. And even if it was, would looking at those images from space reveal the situation in a way that we could fully grasp? Looking at satellite images of Nares Strait is a whole lot different than being in Nares Strait. That much, all of us can tell you. Knowing that the ice in the Arctic is thinning is a whole lot different than experiencing that thinning ice. We are taking the month of August off! We need a break before we begin the extensive process of reviewing and cataloging footage. Meanwhile we have plenty of time to think about the magnitude of what we witnessed – perhaps, a new phase in the“breakdown of the Arctic Ocean”. This story is so much bigger than we thought it would be. We could hear the plane, but could not see it through the fog that was quickly descending. When Steve had spoken to the pilot six minutes ago, we could see the six kilometers across Carl Ritter Bay, and the cloud ceiling was at 1200 feet. But now, it was dropping fast, and with it, our chances of the Twin Otter landing were fast diminishing. The plane flew overhead and then away. You could hear a pin drop as all of us keened our ears for the sound of the plane returning. Minutes passed. And we all thought, that was it. But then we heard the plane again, zooming by somewhere in the clouds off to our right. And then silence. Now we couldn’t see across the Bay. The clouds were maybe at 500 feet. That is when Steve called the pilot a second time on our satellite phone. The pilots were trying hard. They knew our story, that we had been out for 33 days, that we had limited rations, and that we were standing there on the tundra in the snow and rain. 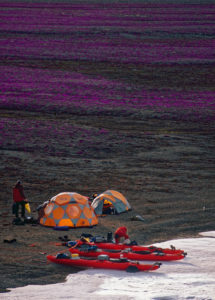 We were stuck at 81 degrees North latitude, some of the most isolated people on the planet. They also knew that if they couldn’t land, we would still have to pay the $35,000 charter fee. But still, there was no safe way to break through the clouds. 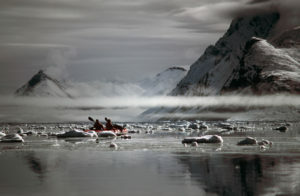 The surrounding mountains were enveloped in fog. Then, like magic, the plane appeared. A mere 300 feet above the ground it circled above us, looking for the airstrip, a flat spot on the tundra, just 900 feet long. And then the Twin Otter disappeared again. For five of the longest minutes in our lives, we waited in the freezing cold, wet, as the plane dipped in and out of the clouds, circling ever lower. 200 feet, 150 feet, 100 feet, 50 feet. Was the pilot going to land? And then, at the last possible moment, it did, using just 450 feet of the strip we had prepared earlier that week. Now we are back in “civilization.” We’ve got four walls around us, and the rain outside is of no concern to us. We are safely ensconced at Atco’s Airport Inn in Resolute Bay, Canada. Our task now is to rest, and then, when enough time has passed to start the year long process of making a film about our adventures in the High Arctic sea ice. The fog has descended. The ceiling is low. It is cold. And it does not look like conditions will change soon. We are huddled in our tents, not cold, but not exactly toasty either. We are hoping conditions will change. If not, the Twin Otter will not come to pick us up tomorrow. Up here, in this mountainous environment pilots fly by line of sight. They do not rely on instruments. If it is foggy tomorrow, we will stay. As “keeper of the keys” to the larder, this is a scenario I have been worrying about. Things were not looking too good, but then Mike found a dry bag with four dinners in it! Now we have enough food for three days of waiting. We won’t be pigging out, but we won’t go hungry either. Either way, we are all dreaming of the comforts of ‘civilization’: salads, hot showers, tacos, unlimited amounts of toilet paper… After thirty three days, we are all ready to leave. For me, our eminent departure is bittersweet. This is an environment I love. In this austerity, every flower, every plant, each insect, is noticed. There is nothing extra. Every bit of life stands out. I am not sure if I will ever return here, or even if I want to return here. This journey has shown us that travel in Nares Strait is not possible, not in the way it was even fifteen years ago. Ice conditions have changed as the Arctic has warmed. So while I really want to return home, to eat tomatoes from the garden, to lie in the shade of a tree, to smell fresh cut grass and wood smoke, to watch fireflies, and to listen to crickets on a summer’s night, I know that I will miss it here. But please, Fog, lift. Let us leave Carl Ritter Bay, our most beautiful and otherworldly home for this past week. Another placid day in Carl Ritter Bay! 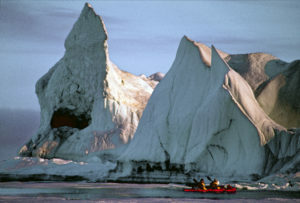 After breakfast (vanilla pudding and oatmeal), we paddled out to a large ice floe on the other side of the bay. It was glorious. After our month of incredibly windy weather, we are rejoicing in the calm. Calm is also good for filming, which we did a lot of today. When we got out to the ice floe, Chris deployed his wave buoys. This was the first chance that he has had to do this, to safely paddle up to a large floe and leave the two buoys he has been carrying around this whole time. Tomorrow, our task is to find that same floe again. While hanging at the floe, a posse of Ring Seals visited. They were so curious, sticking their heads up out of the water, seriously checking us out – for hours. And that was before we fired up the stove and started in on grilled cheese. True confession here: I broke ranks and had a grilled peanut butter/hot cocoa sandwich: think desperate attempt at a Nutella substitute. Yum! And then, on the way back to our camp, with the sun hanging low on the horizon, the water without even a ripple, the silence was broken by the heavy breathy rustling of a walrus. This walrus wanted us to know it was there. It followed us for a bit, never getting too close, but close enough to make me a bit nervous. Walrus are the one animal that polar bears are wary of. And now, it is night. We just finished a dinner of cheesy noodles. Chocolate Pudding is waiting for us to mix in with our oats tomorrow. After thirty days in the wilderness, we are excited about any new combination. I love you Carl Ritter Bay. Carl Carl Carl Carl Carl. As one can tell we are positioned in the lovely Carl Ritter Bay, our third day of calm and relaxing conditions. For once in a month we have had the luxury of enjoying the world of the high Arctic. Of course a day up here would be incomplete without hard labor, and most of our day was occupied with repairing an old airstrip for our departure from our new home. Still, we are happy to be here, filming, kayaking and hiking in the relative warmth and lower winds! Last night we had the lamb dinner, our favorite – dried lamb in a sauce of dried roasted onions, tomatoes, peppers and olives, served with orzo – except for maybe the carbonara or the dried chicken with Thai coconut sauce. There are six dinners on this trip that repeat over and over again. Besides those three are a chicken curry with dried fruit and veg, an adzuki bean chili with polenta, and lentils. The lentil one didn’t quite work out as planned, but tweaked a bit, cooked up with some salami and noodles and a few bouillon cubes it makes an awesome soup, good for lunch too. Planning meals for this 33 day long journey was a mind boggling affair – huge spread sheets, lots of online shopping at sights that catered to both hikers and preppers, and a million trips to grocery stores to find cheap organic foods. The final shop was done in a specialty cheese shop in Quebec. After a world class tasting experience, Bryce and I walked out of there with $320 worth of premium cheeses and meats. This was the one item we didn’t want to mess up on. As was explained to us by the man behind the counter, we could get by with less food by choosing products with more intense flavors. Needless to say, never having done this, I was a bit stressed that either there wouldn’t be enough food or that there would be too much for our tight constraints: our total Twin Otter load including us and the kayaks was just 2000 pounds, and space in the kayaks is at a premium. But so far it has worked! Although we miss everything we don’t have (conversation revolves constantly around dumplings, burritos and chocolate cake), the weeks spent drying meat, roasted onions, grated carrots and bell peppers has paid off. Dinners are really good and filling and easy to prepare. As everyone should know by now, we eat grilled cheese for lunch. What we never talk about is breakfast. Except for the odd pancake breakfast, it is gruel: a combination of oats, grains, polenta, seeds, nuts, dried nuts and fruits. With a bit of sugar, it does the job of filling us up. And then there are snacks. We each get our own snack bag. Designed to last for five days, they do, but only if you are over thirty. There seems to be an inverse correlation between age and speed of snack consumption. The same correlation holds true to talk about the same food when it has left the body. Which brings us to that final question, we each got three rolls of “cashmere,” by some accounts, the premium brand of Canadian TP. Just a few days ago, Steve and I interviewed each other atop the ice wall that had just put an end to our ice foot travels, next to a sea of brash ice that made kayaking impossible. Discouragement and frustration was the subject of the day, but we left agreeing that for once, we needed a break. Seldom in life does 5 days holed up in a wind storm constitute a positive development, but us in the Enduring Ice crew know we have to take our chances in any and all of their most minor forms. The long days of southwesterly winds pushed the sea ice north to the mouth of the strait and east to Greenland. For us, this is a godsend. Yesterday, excited by the open water, we paddled 2km in a fierce 20 knot headwind before retiring due to heavy seas. Today, waking up refreshed and ready, we took advantage of (slightly) reduced winds, and a gorgeous sunny day, taking over half of our remaining distance to Carl Ritter Bay. Few days of this expedition have ended with tired bodies attached to happy people, but after making significant progress while staying warm and no major injuries to report, the mood is practically gleeful. Finally we got a damn break! The predominant wind is still strong and from the south, so we are again waiting in a river valley for an abatement in the wind around 2am Friday. At that point, we will scoot the next 10km into the bay and spend a week there filming and exploring. When your 35-day kayak trip ends up just with 3 days of ocean travel, every day you move is blessed.